The U.S. housing market has fallen into a double-dip slump after last year’s stimulus-driven stabilization and will continue to weigh on the pace of economic recovery through the coming year. Housing-related output has fallen dramatically since the bubble burst in late 2006, detracting an average of 70 basis points from quarterly GDP. 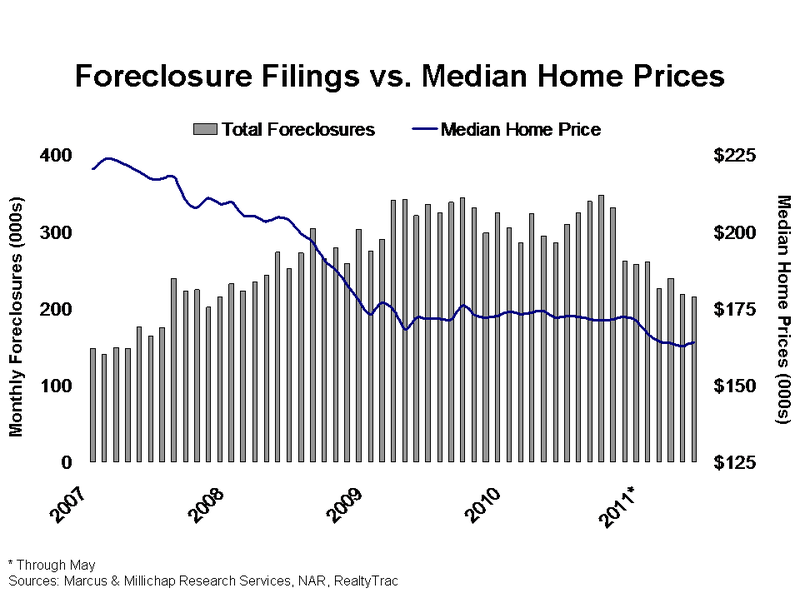 Additionally, while personal consumption has picked up significantly in the past year, further deterioration in home prices risks consumer pullback as depreciating home values have already cut more than $7.6 trillion from total household wealth. New home sales continued their decline in May and are down 77 percent from peak to 319,000 units. Sales of existing homes fell to an annualized pace of 4.8 million units and remain 34 percent below their 2005 high. While the homebuyer tax credit edged prices up in late-2009 through mid-2010, the median price has since tumbled 7 percent from the artificially supported levels to $164,000, matching 2002 prices. for 31 percent of sales, down from 37 percent in April but unchanged from the same period last year. With values still depressed, strategic defaults remain an added risk for housing as approximately 28 percent of single-family mortgages are underwater, with negative equity averaging roughly $68,000 per borrower. The shift in the housing landscape forced homeownership rates lower over the past 6 years from a record high of 69.2 percent in 2004 to 66.4 percent. During this time, owner-occupied households declined significantly, while renter-occupied households expanded by approximately 4.4 million. Although the majority of former homeowners displaced by foreclosures likely rent single-family homes, apartments have also benefited. Since homeownership rates began to fall, apartment vacancies have declined 100 basis points to 6.2 percent and will dip to 5.6 percent by year end. Home sales have historically correlated with household-related purchases at furniture, electronics and building materials stores. Since housing began to tumble, annual retail sales in these sectors have diminished by $78 billion, resulting in the closure of national big box retailers, such as Circuit City and Levitz Furniture. While such closures pushed big box vacancies 380 basis points above pre-recession levels, newly expanding retailers including east coast electronics store hhgregg have helped recompress big box vacancy rates by 130 basis points from their 2009 peak to 7.9 percent. This entry was written by marcusmillichap, posted on June 25, 2011 at 4:06 am, filed under Research and tagged Housing. Bookmark the permalink. Follow any comments here with the RSS feed for this post. Trackbacks are closed, but you can post a comment.